An industrial vibrating conveyor’s operation is typically based on the natural frequency principle. 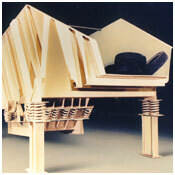 At the natural frequency, the conveyor will vibrate indefinitely with only a small energy input. Once the drive initiates the conveyor’s vibration, the supporting springs help maintain constant motion under the conveyed load, by alternately storing and releasing most of the required energy. A vibrating conveyor, vibrating feeder or screener typically consists of a base member below a spring-supported horizontal pan (or trough). The pan can be modified with various equipment, such as liners, screens, etc. The drive is typically an electric motor with a fixed eccentric shaft or a rotating weight. In operation, the drive transmits vibration through the support springs to the pan, counterbalance, or base member. The pan’s vibration continuously throws the material upward and forward, thus moving the material in short hops along the conveyor. There are four basic types of vibrating conveyors: 1) non-balanced base-mounted, 2) isolated weighted base, 3) counterbalanced base-mounted, and 4) isolated counterbalanced. The air knife system provides an effective, efficient means of separating heavy metal, stone, plastics, paper and other debris from aluminum beverage container (UBC) scrap. Process is intended to reduce residual contaminant build-up in the recycled alloy, reduce furnace melt loss and recover other recyclable materials from the aluminum such as lead, copper, paper, plastic, etc. 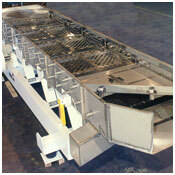 More on our vibrating feeders, vibrating conveyors, screeners, quenching conveyors and air knife separators.